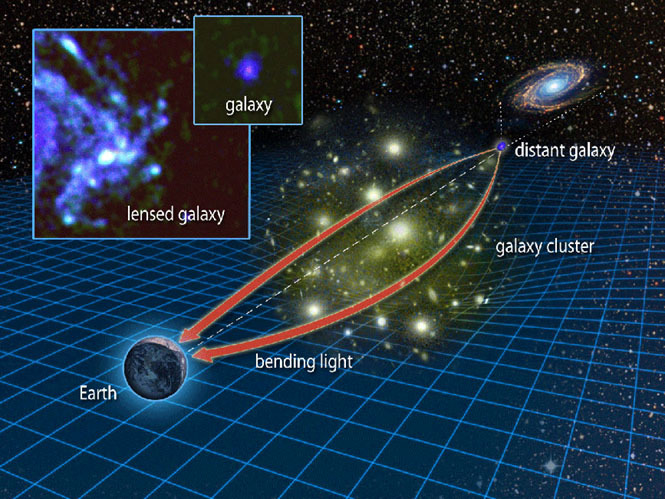 Gravitational lenses are a unique instrument for the observation of very distant galaxies, otherwise invisible. The lens is normally made up of a cluster of galaxies between us and the remote object. Unfortunately, these clusters are not perfect lenses, and the distribution of mass within them typically causes the image of the background galaxy to be rather distorted. This problem, until now, has made it impossible to have a clear picture of what these distant objects discovered via gravitational lenses look like. It wasn't possible to investigate their structure or chemical composition, or investigate their evolution. But now, re-examining a Hubble Space Telescope image (already published in 2009 in another work)a group of researchers at the University of Hawaii, including Tiantian Yuan and Lisa Kewley, has identified, at the edge of a galaxy cluster, a well-defined image of a spiral galaxy at a distance of 9.3 billion light years, so that it lived in a Universe only a third of its present age. The galaxy, called Sp1149, has been amplified by a factor of 22 (large inset above) compared with how it would be seen from Earth in the absence of the lens (small inset). Although it is still very faint, it was an ideal target for the 10 metre Keck II telescope in Hawaii, that Yuan and Kewley use to investigate spectroscopically the distribution of elements within spiral galaxies. The results are extremely interesting, because the levels oxygen are high in the central regions but fall towards the spiral arms, indicating that chemical evolution in galaxies started in the centre, where, evidently, the first stars lived and died and enriched the interstellar medium with metals (elements heavier than helium). Understanding where the chemical evolution in galaxies began is fundamental for the testing of theoretical models. Until now, the only objects in which this could be studied were relatively nearby, and so already too evolved to identify with any certainty the regions that evolved first. The situation is a little like seeing a frog and not knowing that it has passed through the tadpole stage.